Dana's has been providing locally grown plants at the market for 43 years. Dana and her plants can be found second space inside the long red building at summer market and in the back room at the Spring Shows. They sell heirloom tomato plants, other veggie plants, flowering shrubs, container garden plants, hanging plants, and a really great selection of unusual perennial plants. Dana's business is located on Route 97 in Littlestown, Pa. on the road to Gettysburg. She will be selling flowering plants , herbs and perennials at the Spring and Summer Markets. House plants only at the Christmas Market. Darlene Robertson and Dana Gilmore have been baking the hand rolled cut-out cookies for a long time. Darlene's mom and Dana started out 44 years ago with thin sugar cookies and gingerbread boys. Since then they have added 13 more varieties of all home made cookies. 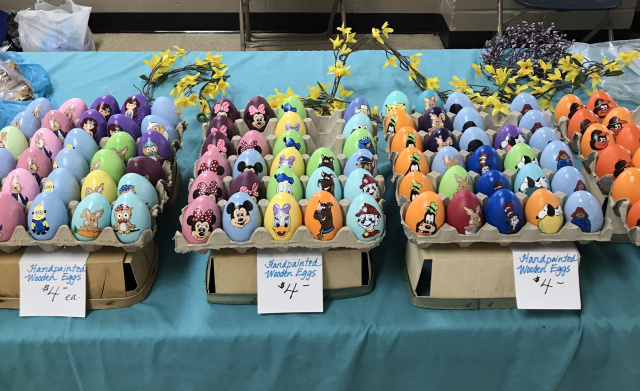 They are located in the back room at the Christmas Market, Spring Fling, Easter Market and the new Fall Show. Orders can be placed ahead of time for the Christmas Market only. You can email Dana for an order sheet. Heather's Kitchen is open every Saturday the Farmer's Market is open. We serve made to order breakfast and lunch all day. Our food is "down home cooking" made from scratch. Customers can choose anything from a variety of breakfast sandwiches, platters, pancakes, and omelettes for breakfast. For lunch we have excellent handmade pulled chicken salad, handmade bar-b-que, hamburgers, hot dogs, turkey clubs and BLT's. We make our soup from scratch and serve homemade cakes and pies for dessert. We open as early as 7:30 and serve breakfast and lunch till closing Our prices are reasonable and our service is friendly. There is plenty of seating for eating in or there is carry-out available as well. Nelson Apiaries bring all-natural and raw local wildflower and other delicious varieties from across the United States to the Carroll County Farmer's Market. Honey is available in sizes from 2 oz. mini bear to 1 gallon jug. They welcome advance and custom orders - just call! Come visit them at the Market and sample all the honey varieties! Other products form the hive include 100% pure beeswax 1 oz. bars, 1 lb. blocks, and beeswax candles. Try our handcrafted beeswax lip balm and all natural honey soap. Select fun honey straws and honey candy for a sweet treat. 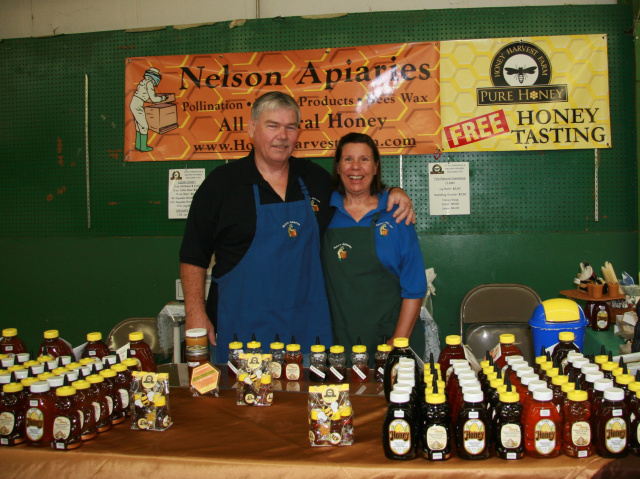 Nelson Apiaries has been a part of the Farmer's Market since 2007. Nelson Apiaries bring all-natural and raw local wildflower and other delicious varieties from across the United States to the Carroll County Farmer's Market. Honey is available in sizes from 2 oz. mini bear to 1 gallon jug. They welcome advance and custom orders - just call! Come visit them at the Market and sample the honey! Other products form the hive include 100% pure beeswax 1 oz. bars, 1 lb. blocks, and a nice selection of candles. Try our handcrafted beeswax lip balm and skin scent; as well as all natural honey soap. Select fun honey straws and honey candy for a sweet treat. Nelson Apiaries has been a part of the Farmer's Market for 9 years. Fabric artist, Toby Merriken, creates beautiful hand sewn placemats, appliance covers, quillows, pillows, totes, purses, aprons, bibs, and other home and personal accessories. Custom orders are always welcome. Toby has been participating in the Carroll County Farmer's Market since 1996. Her Spring and Christmas Shows at the market are in the back room and the Summer Shows are in one of the metal buildings. Wendy and Jim Plank, along with their two children, Jessica and Zach have been providing quality produce to the market for over 25 years now. They offer a full range of fruits and vegetables from their 13 acre farm in Union Bridge, Md. Along with produce, Wendy has been selling her crafts at the market. Highly sought after are her sculpted Santa Gourds. They are one of a kind keepsakes, each and every one carefully handcrafted, signed and dated. She also offers a full range of seasonal gourd creations. Wendy can be found in Burns Hall for the Spring and Christmas Markets, and in the long red building second on the left during the summer markets. Wendy will be at the Spring Shows: March 23, April 20, May 11 - Burn's Hall. Summer Dates Jim and Wendy will have fresh fruits and vegetables June 15-Sept. 7. Fall Date: Oct. 5 Jim and Wendy will have pumpkins and mums. - Burn's Hall. Christmas Dates: Nov. 2, Nov. 9, No. 16, Nov. 23, Nov. 30, Dec. 7, Dec. 14. - Burn's Hall. Owner Carolyn Faulkner has been with the Market since 1999. Her stand is located on the right side in the second section of the long building. She sells beautiful wreaths and wall hangings. You will also find various sizes of silk floral arrangements and wreaths for all occasions, as well as an assortment of specially designed baskets. Her table and candle centerpieces make great home accents. At the Christmas Market her small decorated trees are very popular.